Wafer-thin crêpes, smoked ham, vegetables, all enhanced with delicious and fragrant Double Smoked Cheddar Cheese – ideal for entertaining, brunches, buffets, special occasions. Melt Lactantia butter in medium saucepan. Whisk in flour and mustard; cook 1 minute, whisking constantly. Gradually whisk in Beatrice milk; cook and stir over medium heat until mixture comes to a boil and thickens. Add wine and Balderson Double Smoked Cheddar Cheese; stir until melted. Stir in black pepper. Set aside. Beat eggs until light. Stir in Beatrice milk and water. While whisking, gradually add flour and salt; whisk until smooth. Brush some melted Lactantia butter on a small (6-inch/15 cm) frying pan or crêpe pan. Place over medium-high heat until butter is sizzling. Pour 2 Tbsp. (30 mL) of batter quickly into the pan and tilt the pan back and forth to spread the batter evenly. When lightly browned on the bottom, gently slide crêpe to a plate or work surface. To assure tenderness, crêpes should not be turned over in the pan. Repeat process, buttering pan each time, until batter is used up. 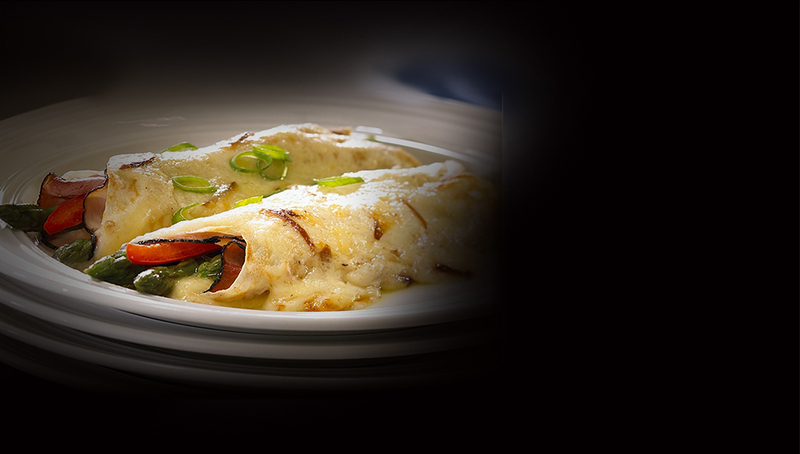 Line each crêpe with 1 ham slice, 2 asparagus spears, and 2 red pepper strips (optional). Top with 2 Tbsp. (30 mL) shredded Balderson Double Smoked Cheddar Cheese. Roll up tightly and place in one of 2 buttered 13×9-inch (3.5L) baking dishes. Repeat to make 24 crêpes, 12 in each dish. Spoon Cheese Sauce over crêpes in both dishes. Sprinkle each with remaining cheese. Bake at 400° F (200° C), uncovered, for 25 minutes, or until bubbly and lightly browned. Sprinkle with green onions. This recipe calls for 500g of Balderson Double Smoked Cheddar Cheese; which yields 5 cups (1.25L) of (packed) shredded cheese.